I agree with the article, it's great, I use it to do CI/CD for this very website. Nothing much to say. The build UI is not great on mobile though. Cannot do iOS/Android builds though? Still use it, gets the job done. Nothing more to add. 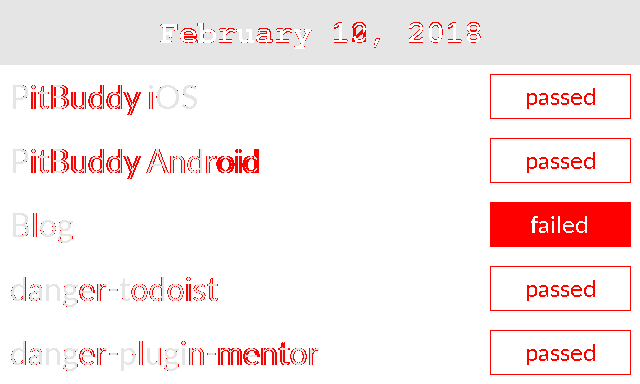 It's running the danger-todoist builds. I found the configuration weird in the beginning, but you can get used to it. 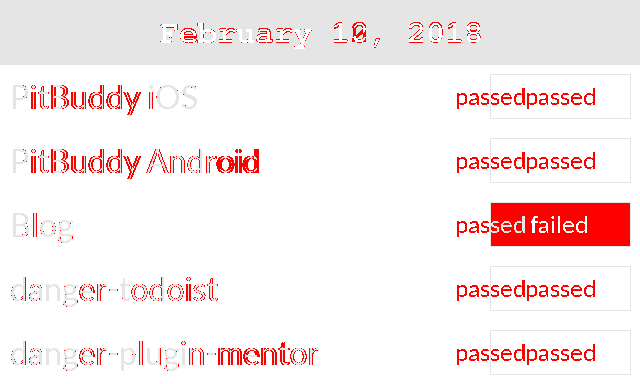 Major plus: Can do both my iOS and Android builds for PitBuddy App for private repositories. I think Nevercode aquired Buddybuild at some point. I was using Buddybuild for iOS builds and when I started to get an Android build going it just was impossible to setup and massively unreliably. Can't say much about Nevercode, but I am happy I left Buddybuild for Bitrise. Obviously I just recently started using it, so far so good. Can't do iOS/Android. Build speeds are great up until now. Is this the solution to doing both web, iOS and Android in one tool? Hosting the code there as well? Seems tempting! I like Gitlab the SCM tool, and Gitlab CI has come a long way. That's it, just a quick reminder on what I already tried and would like to try. After traveling abroad for more than two weeks and then spending two days laying by the pool I naturally got a bit of a tech craving. To spend the afternoon I set myself the challenge of fixing a small bug on this blog, having nothing more than some Hotel WiFiâ„¢ and my iPhone at hand. But that must be enough, right? Letâ€˜s see how it went. 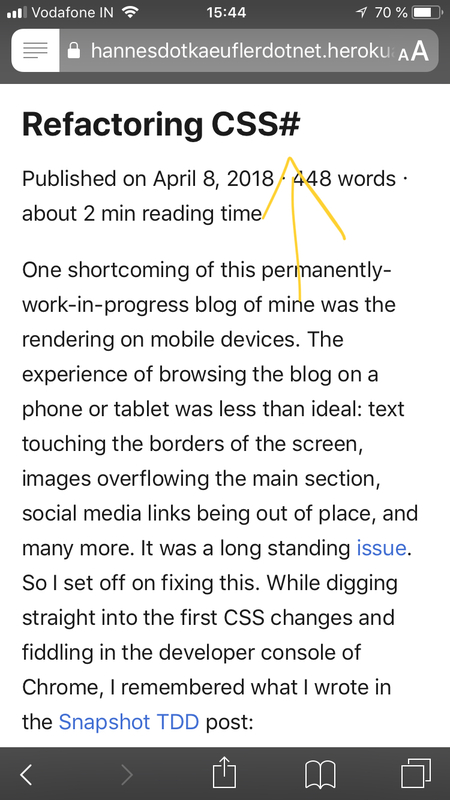 In this blog I display a permalink hash next to the blog posts title, which is a link to view the post separately as well. When using e.g. Safariâ€˜s â€žReaderâ€œ mode, this hash symbol is of no use and should not be there. So how can we get started on this? First we need access to the repo of course. I had come across an app called Working Copy, and looking that up in the App Store was promising: I can check out the repo to my iPhone. What a time to be alive! ï¿¼ Not only can I check out the source code, but it comes with text editing capabilities as well. Making the change was pretty easy it seemed. I first browsed for the test that verifies the permalink, and removed the expected hash symbol from there. Switching between GitHub's mobile and desktop version was kind of clunky and still didn't allow me to upload any screenshots. I then realized that my twitter feed had mentioned Ryan Nystroms GitHawk in the past. One more trip to the App Store and yes yes yes, that is much more pleasant than the website! Editing issues / PRs is way more comfortable and image upload works as intended. That will be a much better combo I think, I am looking forward to using that for the next exercise. Of course this exercise was purely recreational. I was in no way forced to write or deploy code from halfway across the world on my iPhone, but I kind of wanted to. Things of visual nature are not unit-tested easily, which is why they are often simply untested. We usually don't test stylesheets, colors, images etc. However we can't say those things are unimportant. Unhappy about the workflow I just started and taking into account the above thought, I typed some words into google and emerged with this awesome tool: BackstopJS. It's headlined with "Visual regression testing for web apps" and was exactly what I was looking for. It provides a safety net for changing the visual nature of something rendered in a browser by taking and comparing screenshots. Basically exactly what I manually and crudely setup for the e-ink dashboard, just so much more awesome. You will get a really nice page telling you that the tests were failing. Why? Because you have not approved any reference images yet. Once you look at those images and assert that this is currently the way things are looking, go ahead and backstop approve those. Now you are golden and able to make changes to your pages CSS without having to fear to a) break thinks if you are refactoring, or b) having a super quick way to get an overview of the changes you made across multiple pages of your blog in different viewports. With my page being a blog, the content obviously will continuously change, making the comparison of the current look against reference images unfeasable. 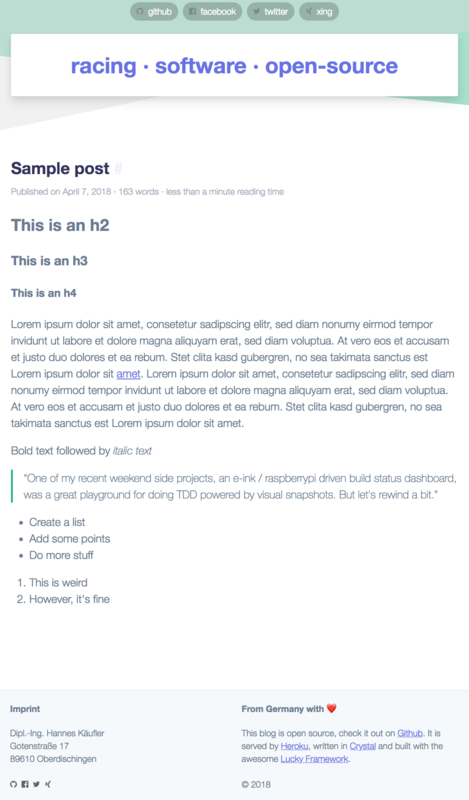 Luckily this is an easy fix: I created a new database containing exactly one sample post, which uses all the usual tags like h1-h6, lists, blockquotes to showcase most of the styles coming into play. As always, you can follow along to the PR on github. One example of a change to the reference image can be seen here. I must say I am mega impressed with BackstopJS and will try to use that again in the future. 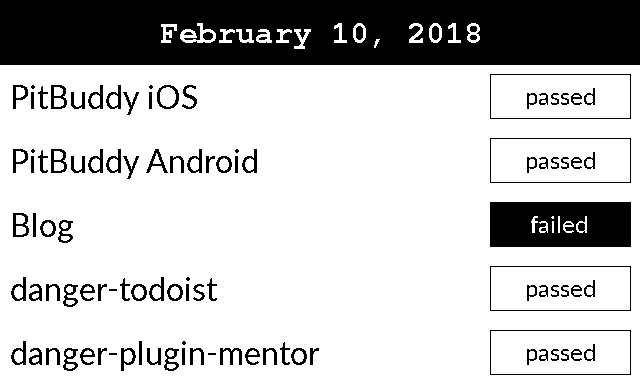 One open task is to get that running on CircleCI as well.